This petition was created by Truth & Facts Never Lie on February 2, 2017. NOTE: This Petition is replacing WE the PEOPLE petition established on February 1, 2016, screenshot provided below. 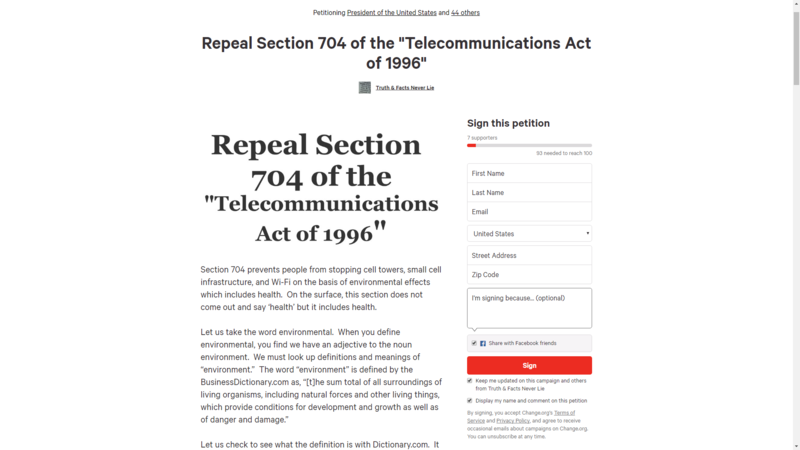 This petition is located at this web address: https://petitions.whitehouse.gov/petition/repeal-section-704-telecommunications-act-1996 since WE the PEOPLE is failing to keep the petition updated and current with everyone's signatures, Until February 13, 2017, as of today (Feb. 13, 2017), this site shows that we have a total of 48 signatures of the 100,000 signatures needed by March 3, 2017. Truth & Facts Never Lie has also set up this page to collect your signatures. Section 704 prevents people from stopping cell towers, small cell infrastructure, and Wi-Fi on the basis of environmental effects which includes health. On the surface, this section does not come out and say ‘health’ but it includes health. The common themes with environment are “surroundings,” “organisms or plant or animal,” and “conditions or factors or influence” on them. This tells us that the atmosphere around something living can have either a negative or a positive consequence or both. Therefore, by trying to say that Section 704 does not cover health is absurd. The wireless industry is infiltrating the atmosphere or Earth’s surroundings with microwave and radio-frequencies which constitute as the environment. This affects the natural electromagnetic charge of the planet, plants, animals, humans, and all living organisms. This barrage of multiple frequencies entering into every living organism’s surroundings has affected and influenced the growth, the development and survival of each and every living organism. This constitutes as the health effect through the environment. The effects of microwave and radio-frequencies have been known for 80+ years. It has been recognized by many countries including our own. The US Naval Medical Research Institute published a research report number MF12.524.015-0004B titled “Bibliography of reported biological phenomena (‘effects’) and clinical manifestations attributed to microwave and radio-frequency radiation.” This 1972 report has five pages of ailments contributed to microwave and radio-frequencies. People are getting sick with cancer being the leading ailment. Currently, the United States Government allows the wireless industry to hide behind Section 704 which prohibits people from stopping wireless technology because of health. This must STOP! Everyone who wants to support this petition, please go to either our Petition Form Page or Change.org and fill out the forms at either or both sites. Thank you and have a wonderful day. Please note that I will need a valid email address if you plan to have petition updates. □ Please check mark the box to the left if you would like to get updates on this petition. Please note: I helped label the information you will need to put into each of the boxes on the right so you are able to read them easily. ​​Please note that all signatures provided through my petition form page will be added as soon as I possibly can and all signatures found on Change.org petition will be added to the signatures page on a weekly basis. Thank you for signing this important petition! Have a wonderful day!